ATDB • View topic - SRA goods train over Sydney Harbour Bridge. SRA goods train over Sydney Harbour Bridge. 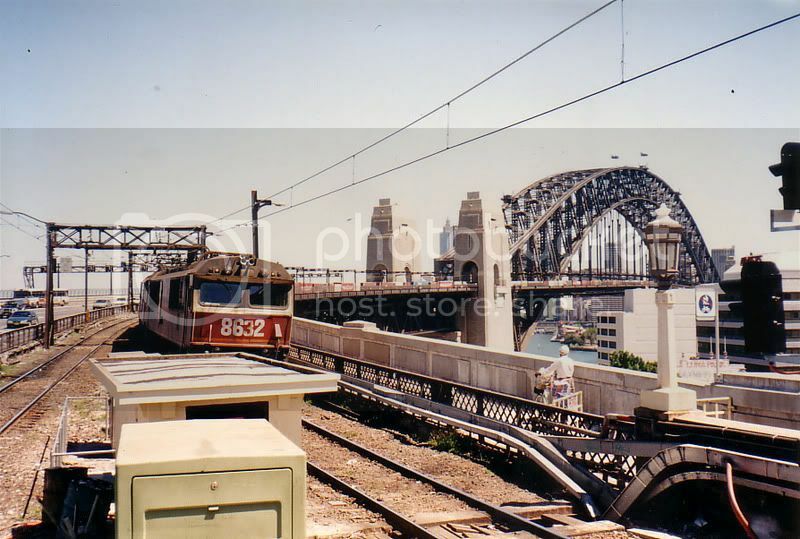 Another pic dug from my vault is the rare sight of a goods train diverted over the Sydney Harbour Bridge during trackwork on the main North Line. Taken in the mid 1990s sometime. God, I love that livery. I think it is more mid 1980's that 90's. SRA locos in the 1990's were in blue and gold livery!!! Also by mid 1990's the UTA/STA bendis were more or less in the livery we see today!!! Well Fred, The XPT/Xplorers have been known to have crossed the bridge too. Whether sending XPT/Xplorers or frieghters through Wynyard tunnel, from my point of view, would have made not much difference. Would we see a repeat of this nowadays without any electric locos? fm wrote: Well Fred, The XPT/Xplorers have been known to have crossed the bridge too. They sure have! And if only Railpage's image gallery was working . There are a couple of shots of Xplorers and XPT's passing thru Milsons Point Rly Stn. Who knows anything is possible? Red and Cream wrote: Would we see a repeat of this nowadays without any electric locos? I remember freights that went through the underground, that could have been hauled by electrics, but instead had 442's (Jumbos) and 45 classes on the front. Didn't those freights make the North Shore whingers, whinge loud lol. I knew a couple of Delec train drivers who were infamous at throttling up as they went through Town Hall and Wynyard stations. There is nothing like the smoke from a 4 stroke ALCo. well, apart from a good old steamer going through Toowong Station in Brisbane. BTW, how do XPTs usually get over the harbour? jb17kx wrote: well, apart from a good old steamer going through Toowong Station in Brisbane. They go around through Strathfield and Epping, not over the bridge and up the North Shore line. Central doesn't have the layout to allow country trains, electric, XPT or Explorer's to over the bridge unless they use the suburban platforms. If there are track works on the line through Epping you will sometimes see Newcastle electrics use the bridge, but they use suburban platforms. During these works they will normally allow XPT's and Explorers run through the works, must be much easier to schedule due to their low movement numbers. I think what he mean't, was how did they run during trackwork? When the XPT's ran via the North Shore during trackwork, they got into Platform 16, just before departure time about 3 minutes if I remember correctly, got loaded and then proceeded to Hornsby direct. When they came back, they arrived onto platform 18 and proceeded to the XPT depot at Meeks Rd. Interurban trains did the same but the went out to either Eveleigh/Acdep or Flemington Car Sidings when required. Hopefully this sheds some light on happenings? They start at their usual platforms for loading. Head west to Olympic Park before heading Central bound via Platform 16 and the North Shore Line. Sydney bound they do the opposite. Double 86s, with a consist of boxes. As you can see in the photo, it's just a little longer than your average 8 car suburban set. Love the brown O.305G in the background as well. fm wrote: I think it is more mid 1980's that 90's. SRA locos in the 1990's were in blue and gold livery!!! Also by mid 1990's the UTA/STA bendis were more or less in the livery we see today!!! There is what looks to be an EB Falcon in the picture - so that would put it in the 90s at least. There were candy locos running around for a long time after FreightRail was formed. There are lots of pictures around where FreightRail and Reverse liveried trains are together some missing out altogether on going into candy! Great image -I bet the driver(s) on the train were pumped. Re: SRA goods train over Sydney Harbour Bridge. Crossing Sydney Harbour using the Harbour Bridge and travelling north can be done from the Inter-City platforms at Central. A few weeks ago I was on a Newcastle train parked at one of the said platforms, but due to a freight train breakdown at Beecroft it had to go via North Shore. What the train did was travel to Erskineville and switch back (Zigzag Railway style) to the suburban platforms at Central. From there it went to Town Hall then Wynyard and over the Harbour Bridge to Hornsby, Central Coast and Newcastle. Mind you half of the passengers who were travelling forward to Erskineville then travelled backwards. Always having something to say, having a good laugh and having fun all at the same time. Route243 wrote: Crossing Sydney Harbour using the Harbour Bridge and travelling north can be done from the Inter-City platforms at Central. But it had to come back through a second time using the suburban platforms, regardless of weather it stopped or not. Either way with those two clues it's definitely a shot taken in the last coupla years that the 86s wore candy livery.